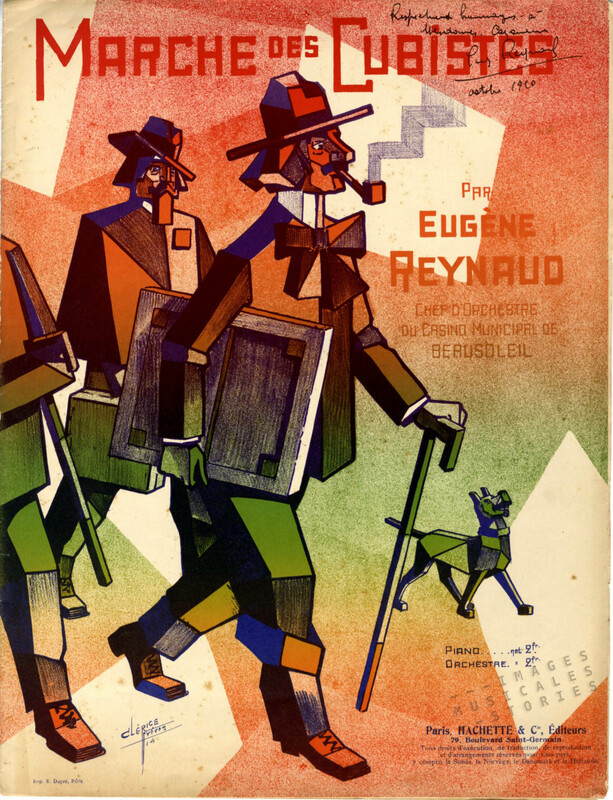 ‘Marche des Cubistes’ by Eugène Reynaud, published by Hachette (Paris) and illustrated by Clérice Frères in 1914. 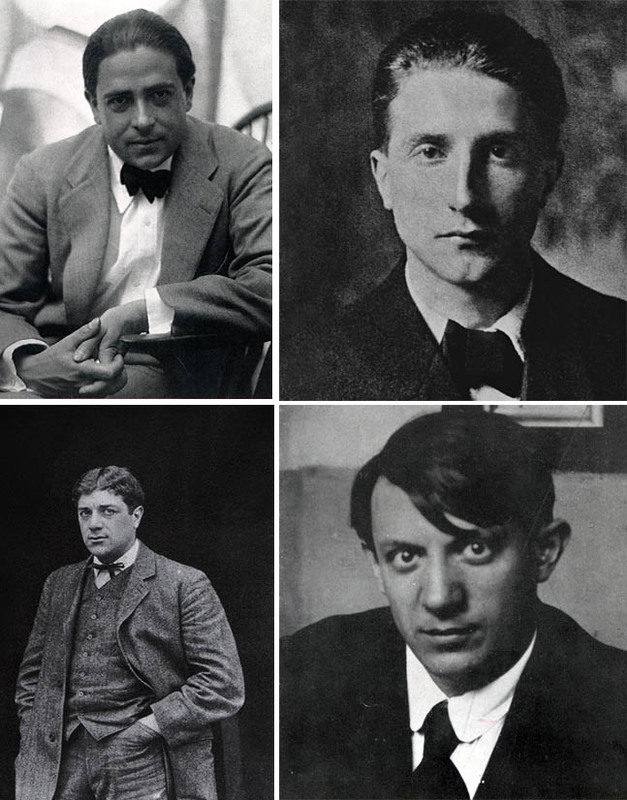 Georges Braque and Pablo Picasso pioneered the cubist style from 1907 on. By the time that Clérice created this ‘cubist’ sheet music cover in 1914, just before the outbreak of the Great War, the revolutionary trend was already past its prime. But apparently it was still bon ton to mock the avant-garde artists. 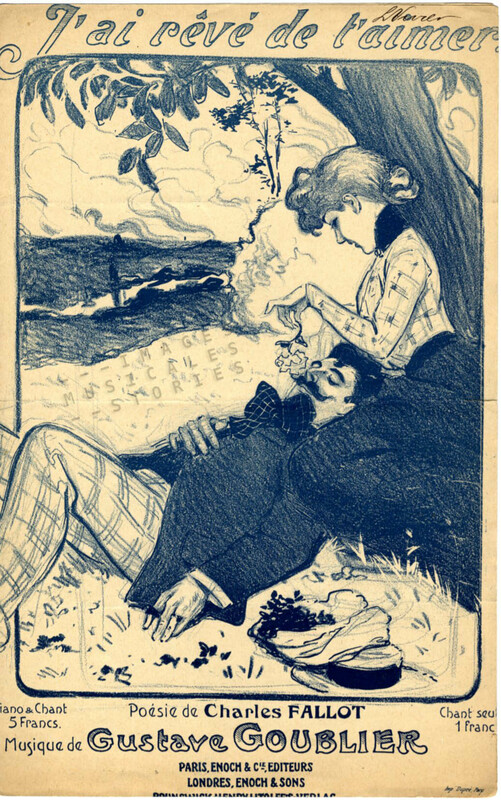 It puzzles me that for his drawing Clérice chose the stereotype of the Belle-Epoque artist. During the late nineteenth century the archetypical French male bohemian sported a van Dyck beard. It was named for the Flemish painter Anthony van Dyck who portrayed numerous men having shaven cheeks but wearing sharply pointed beards with curled moustaches. The points and the curls were achieved through intense hair brushing and twirling with wax or pomade. ‘L’ Aveu’ by Henri Natif and Villemer, published by C. Joubert in Paris (sd) and illustrated by Faria. Also part of the outfit of the fin-de-siècle artist was the lavallière, a large floppy bow worn around the neck like a pussycat bow. The lavallière got its name from one of the chief mistresses of Louis XIV, Louise de La Vallière who allegedly was the first woman to wear a tie. In the late nineteenth century the lavallière was cherished not only by artists but also by students, anarchists and leftist intellectuals. Even Picasso was still wearing one in 1904. 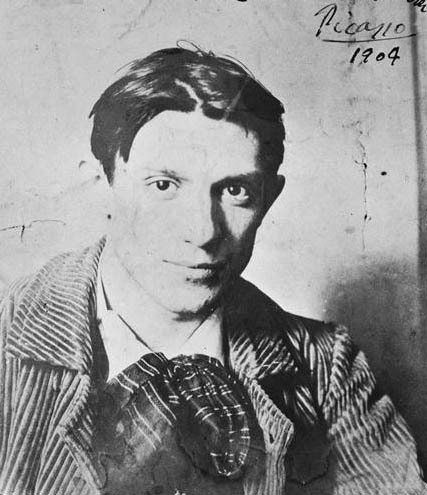 Picasso in 1904 wearing a lavallière and his Spanish corduroy jacket. A large felt hat à la Rembrandt, a chequered or striped garment and occasionally a cloak completed the artist’s apparel, a distinct attire against bourgeois stiffness. 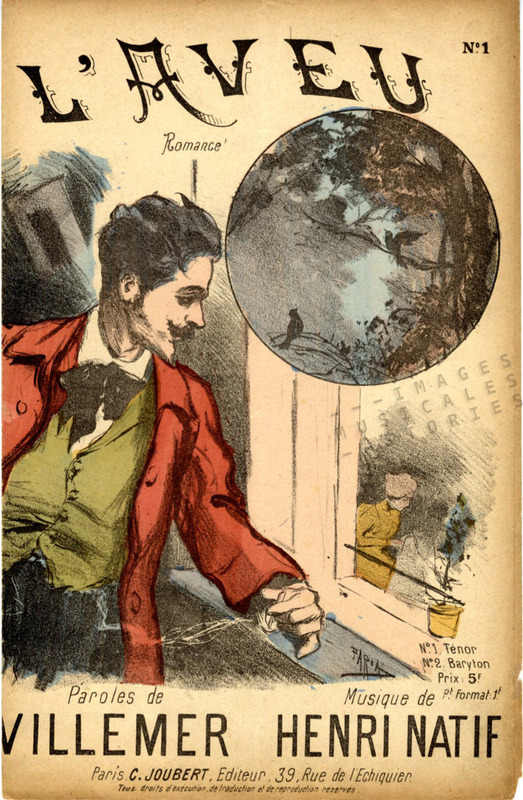 ‘J’ai rêvé de t’aimer’ by Gustave Goublier & Charles Fallot. Published by Enoch (Paris) and illustrated by Leonce Burret (sd). It is often useful for an illustrator to resort to stereotypes. For example, one immediately understood from the cover above that the man being lovingly tickled on the nose was either an artist or a left-wing egghead. On the cover below, the message was also quick and clear: the man unable to pay for his meal is obviously a bohemian artist, taking pride in his precarious financial situation and defying the establishment. 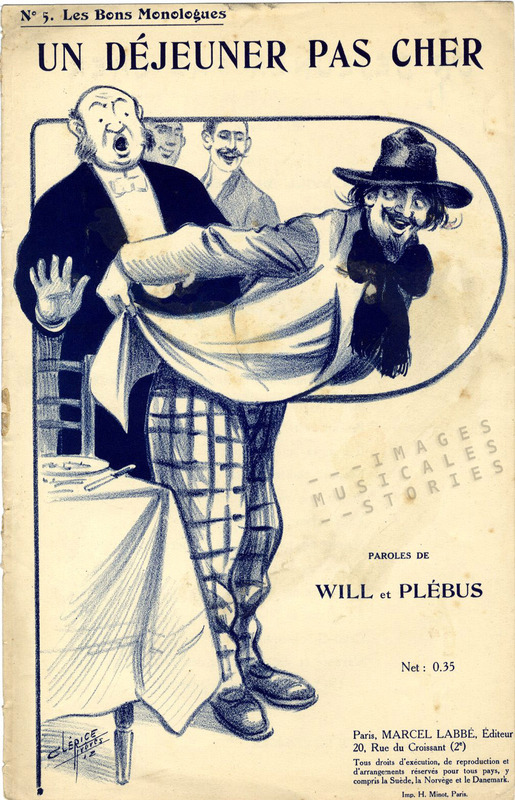 ‘Un déjeuner pas cher’ by Will & Plébus published by Marcel Labbé (Paris) and illustrated by Clérice Frères in 1912. Like the cubists, Clérice naively breaks up his subjects geometrically. But there it stops. It’s a far cry from the way Juan Gris painted his fellow artist Picasso. 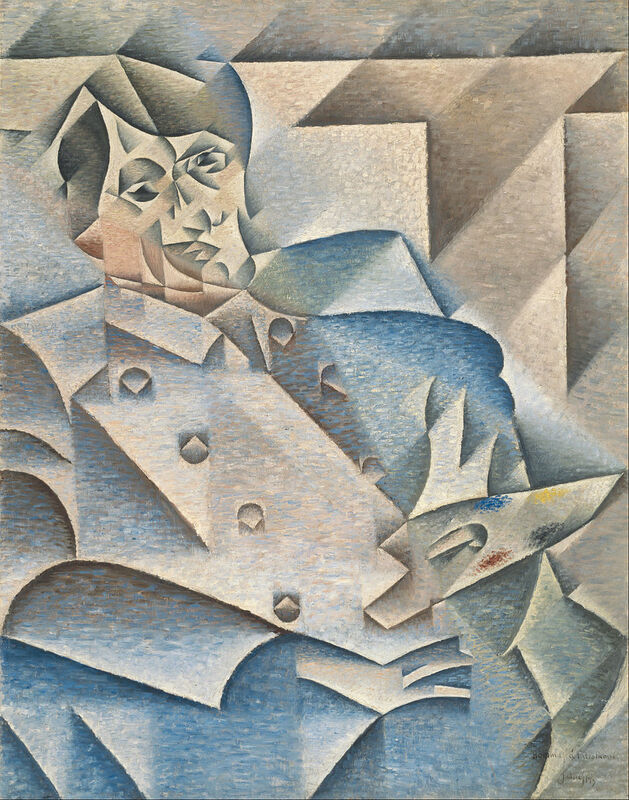 ‘Portrait of Pablo Picasso’ by Juan Gris (1912). 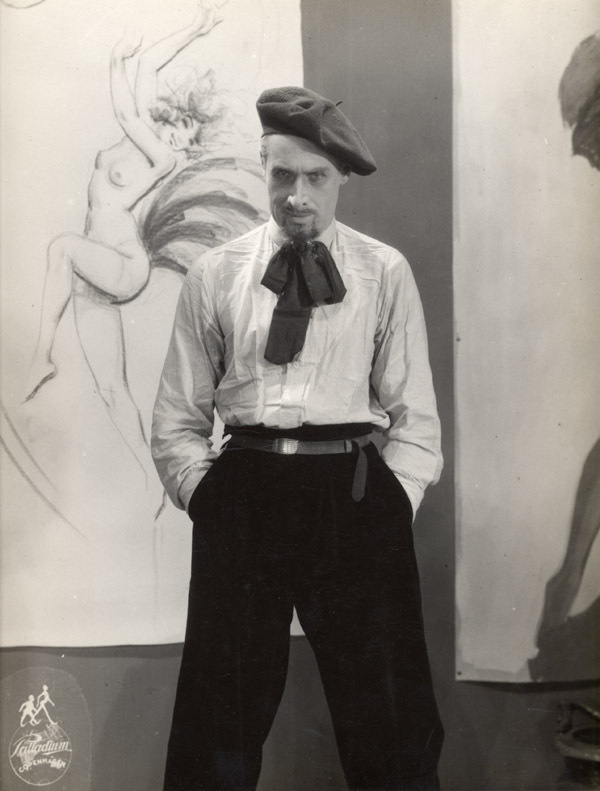 As for Clérice’s stereotype of the artist: the cubists definitely weren’t wearing the Belle Epoque outfit anymore. During the decade preceding the outbreak of World War I, artists from all over the world formed a vibrant, international avant-garde group in Paris. They were ‘modern’ and dumped the pointed beards and the lavallière. They were defiant all right, but with their art and not particularly with the way they dressed. Upper left: Francis Picabia. Upper right: Marcel Duchamp. Lower left: Georges Braque. Lower right: Pablo Picasso. All pictures 1910-1916. Nonetheless, the cliché of the bohemian artist was used well into the twentieth century as can be seen on the photographs below and on our sheet music cover illustrated by Pol Rab in 1921. 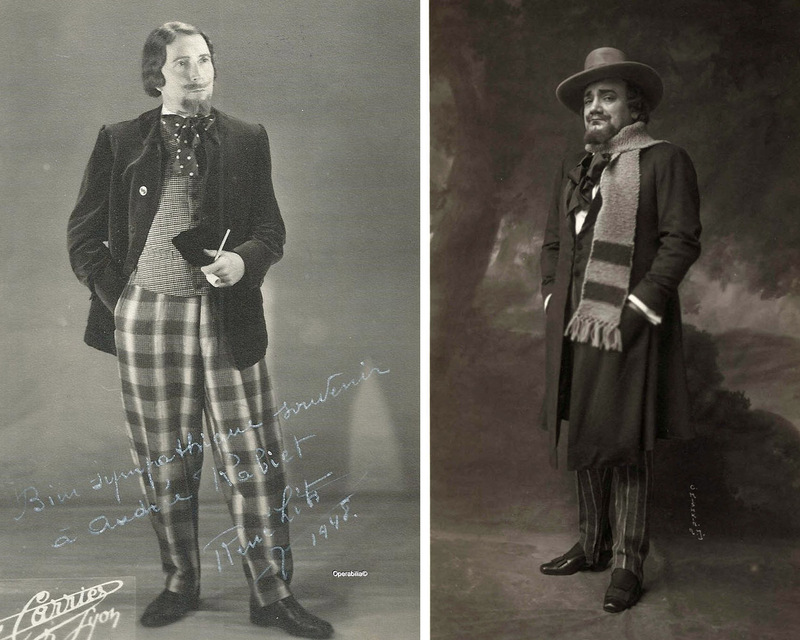 Left: French baritone René Lits, as Marcel in Puccini’s La Bohème (1948). Right: the famous Italian tenor, Enrico Caruso, as Rodolfo in Puccini’s La Bohème (1903). 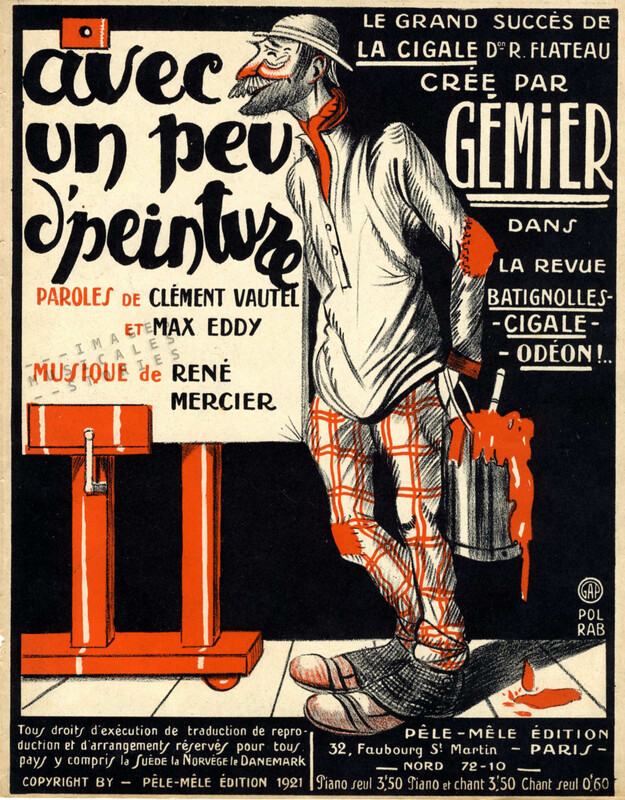 ‘Avec un peu d’peinture’ by René Mercier, Clément Vautel & Max Eddy, published by Pêle-Mêle (Paris) and illustrated by Pol Rab in 1921.
waar halen jullie die prachtige bladmuziek en bijzonderheden vandaan ! Ik heb veel respect voor het werk hetgeen jullie doen. surtout, ne me supprimez pas de votre mailing list ! je me régale chaque week end de vos travaux de recherches.